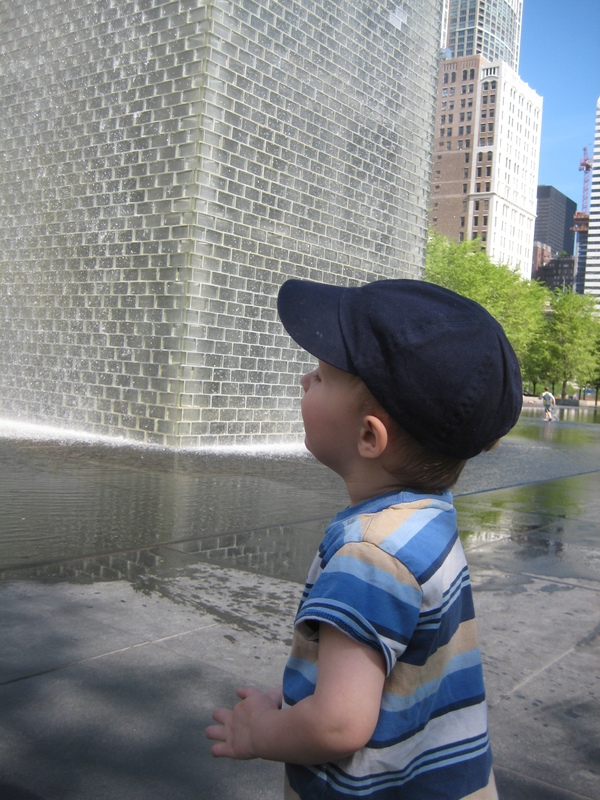 In the few weeks before our trip to Chicago, I scoured Pinterest (where else??) for ideas for traveling with kids/toddlers. I found a lot of good ideas for entertaining three little guys while flying, driving and sight seeing. I found advice on when to travel and where to travel and what to pack and what not to pack. I found all kinds of tips and tricks, some of which worked and some, not so much. Here are the top 5 things I learned, though, from the actual trip. 1. Kids do better than you expect! At least mine did. I think we all imagine the worst case scenario and spend so much time worrying about what could go wrong that we forget what could go right. 2. You know your kids better than you think. Trust your feelings about when (meaning kids’ ages and/or time of day) and where to travel. Chances are, most of the time you will be able to predict how they will react to each activity in your travels. I read several blogs that mentioned to avoid flying during nap time because then you end up with over-tired tots who don’t sleep and make life basically miserable. Makes sense. But I just felt like our guys would be ok. They’ve always been pretty good sleepers. So, our flight home landed right during their nap time. And they slept almost the whole way! So plan according to your instincts. 4. There are nice people wherever you go. I mean it. They really exist! One of the things I was most nervous about was inconveniencing people around us. We were, after all, going to be THAT family wherever we went. The noisy, insane, out-of-control family that everyone else is watching. I was so surprised and delighted when everywhere we went, people were just KIND. I don’t think there was a bus, plane or train that we boarded that someone didn’t offer us a seat or to hold a child or carry a bag. HUGE relief. 5. Your experience will be what you determine it to be. Just as we were pulling into the airport parking lot ready to embark on this adventure, I promised myself that no matter what happened, I was going to be HAPPY and HAVE FUN! I knew that people were going to stare at us wherever we went and that the kids were bound get tired/hungry/cranky at the most inconvenient times but I was determined to have a good time. Also, I wanted to send the message to all of those staring strangers (and more importantly, to my boys!) that my family is important to me and that I enjoy being with them (even during melt downs in the airport). I am so glad I took that moment to prepare myself to be happy. I wasn’t perfect but I thought of that moment on more than one occasion and it helped me get through some of the ugly moments with a deep breath and a smile. I have been pleasantly surprised at how smoothly everything has gone this week and especially how well the kids adapted to everything we did. There were some rough moments but we had fun, got a break from the day-to-day grind and had some good family bonding. I say it was a success! The trip home was actually quite uneventful and I only took one photo today (yogurt breakfast in the room before we checked out) but figured I should wrap up with one last post. We caught a shuttle to the airport (6 bags of luggage + 3 toddlers + a stroller on a train didn’t sound fun) and checked in around noon. Security was outrageously long but thanks to the three amigos in tow, we were ushered to the front of the line. Sweet! No mishaps this go around. We rushed to McD’s for happy meals for some not so happy little campers. They were over-hungry and over-tired and wanted to run their little legs. Cooper had a complete and utter melt down which made me a little nervous about cramped quarters on a plane for 3 hours. My worrying was short lived however. All THREE boys were snoozing away by the time we were in the air! (No, we didn’t give them any drugs, though we considered it…) Not only that, but they slept for almost two of the three hours! I was so, so happy. Even Derek and I got a little shut eye. We had a small inconvenience with our checked bag once we were in SLC but it was resolved pretty quickly and we made it home in time for the boys’ bedtime and Derek’s soccer game. Momma is blogging and eating chocolate in bed. Perfect ending to a perfect week. Our last full day in the Windy City started with breakfast at Pret a Manger (pain au chocolat for me!) and a walk in the park. 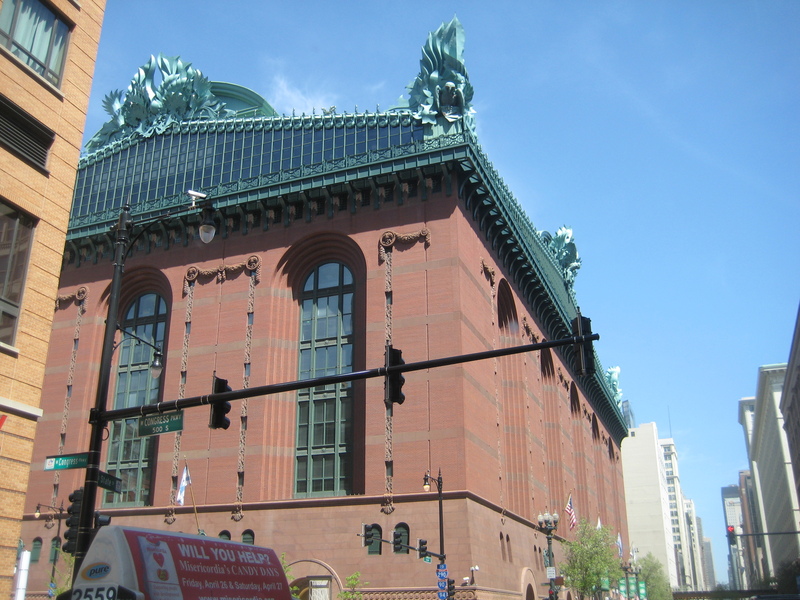 I really wanted to take the boys to the Lincoln park zoo but there just wasn’t an easy way to get there on public transit without taking the bus (not willing to face that disaster on my own– especially after last night) or walking a million miles. Isaac has been a trooper but I didn’t want to push him too far. I have been using my Moby wrap a lot but I was feeling my back starting to act up so I’m taking it easy on carrying boys today. I even tried to take a cab but they wouldn’t take my kids without car seats. That’s good of them I guess but I am disappointed that we aren’t going to make it this trip. We got Chicago dogs and grilled cheese from Chicago Carry Out grill just down the road from our hotel and then had a picnic in our room. Daddy even came up to visit for a minute. Then we all laid down for a blessed and much needed nap–first one they’ve had all week. That’s one upside to missing out on the zoo today. We just spent the afternoon in the hotel room packing. As soon as Daddy was done with his conference we went out for pizza again at Lou Malnati’s Pizzeria. We hoped to swim after dinner but the pool is only for swimming laps. Isaac was very disappointed. But they all got down to bed early so they will be well rested for the plane ride home. The boys and I found Friendship Park Conservatory in Des Plaines (near our first hotel) and ate our sandwiches there. Isaac loved watching some school kids play baseball while we ate. There is a little playground there so the kids played for a little while. We didn’t last long because it was like 85 degrees and all the playground equipment was too hot. I hate that! After lunch we headed to LEGOland. I drove around and around first hoping that the boys would get a good nap. The twins took advantage of the time and snoozed but not Isaac. We got there just after all of the school kids left (about 3:00) and it was perfect timing. We pretty much had the place to ourselves. Isaac was so proud of himself for going down the BIG slide in the play place. I’m glad kids are so easily amused. The day kind of went downhill from there…. The plan was to drop off the van and take the train into town. Derek could have met me at the airport/car rental after the conference but I was feeling brave and said I could do it on my own. I’ll never do that again. We headed to IHOP for dinner (pancakes are Isaac’s favorite) at 4:30. I figured that would get us there in time for an early dinner (no cranky kids!) and then back to the hotel at a decent hour. It would have worked perfectly had we not run into construction and took 45 minutes to go three miles. Awesome. Isaac and Carter were both asleep by the time we got there so I had to wake them up. And they were starving. Cranky kids for dinner again. At least they ate without a fight. But then the twins thought it was the perfect time to have a shrieking competition. They only laughed and screeched louder when I told them to stop. I was so embarrassed. I scarfed my dinner down and then got everyone out to the car before they could start throwing food too. The lady checking in my car was so helpful and so was the shuttle driver who took us to the train. The kids were a little restless on the bus but it was only a 10 minute ride so we survived that leg without a problem. The train ride was a different story. (I so miss you Janel!!) 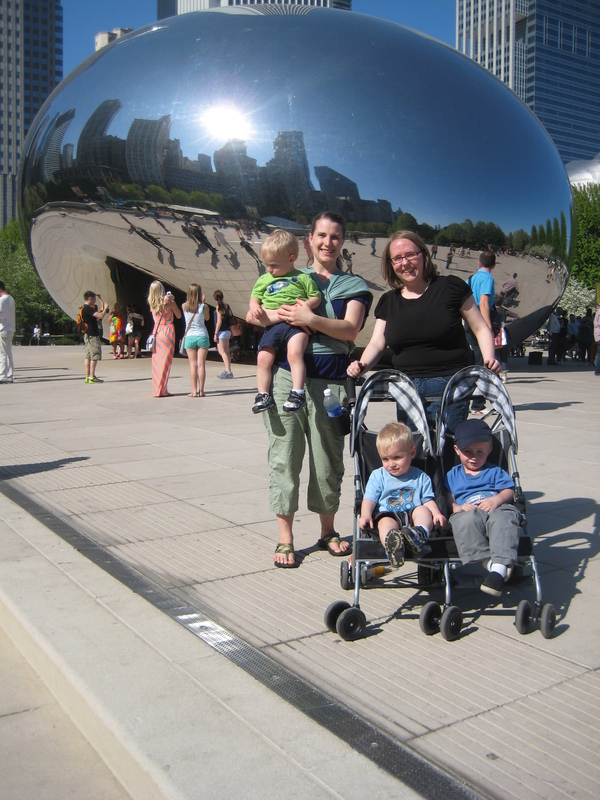 The plan was to leave the twins in the stroller and put them in one of the cars that had wheelchair access. Well, it didn’t work out so I had both twins on my lap and Isaac next to me with the folded up stroller crammed in next to us. The more tired Carter is, the crazier he acts. He would not sit still the whole ride (45 minutes-ish). He would thrash and whine and try to get down and try to sit on Isaac and try to hit Cooper and try to stand up on the seats and look out the window…. At least the other two boys behaved most of the time. About three stops before we were supposed to get off they all snapped. I was holding down two screaming twins and trying to get the stroller open just hoping Isaac wouldn’t run out of the train door at the next stop (he kept saying he was done and wanted to get down to see Daddy). By some miracle, I got the stroller set up and the twins in it before we came to our stop. Derek and his boss Sean met us at the train station and walked us home. Whew. I’m glad that’s over. I’m glad that I usually have Derek to help me tackle the boys in public (and at home!!). He went out tonight after they were all finally asleep and brought me chocolate ice cream to eat while I typed up this blog post. I’m glad he’s mine. Today was the first day of conference for Derek so Janel and I were on our own again with the boys. 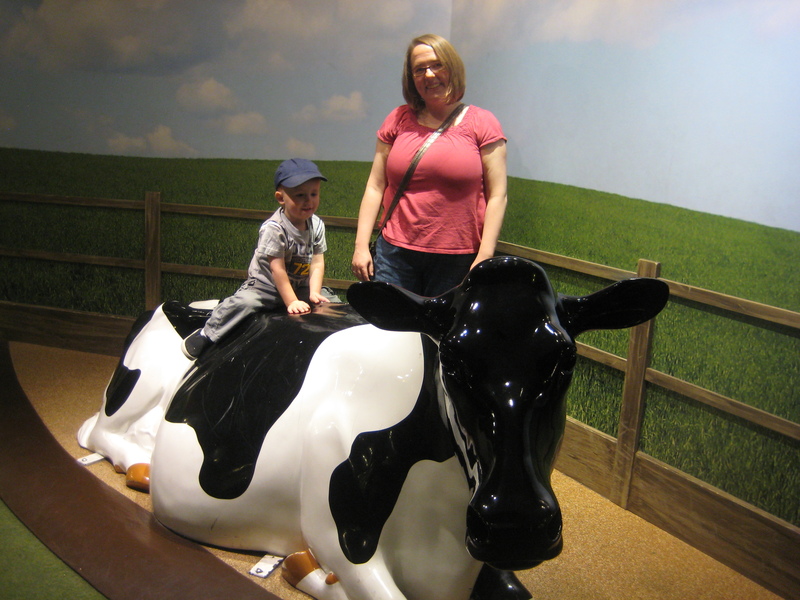 We walked over to the Field Museum after PB&J for breakfast (yeah, no continental breakfast and I wasn’t up for a restaurant with the kids that early in the morning…). We spent almost all day there. We still ran into field trip kids but I felt like there was more room to spread out than in the science museum. Also, the CityPASS got us in to most of the “extra” exhibits that aren’t included in basic admission so we avoided the school kids whenever we went in those. The boys had to hang out in the stroller for the most part but there was a lot to keep them interested: LOTS of animals!, dinosaur bones and lots of buttons to push and okay things to feel at their level. We were able to see a lot and keep the kids entertained for like 5 hours. Pretty impressive. 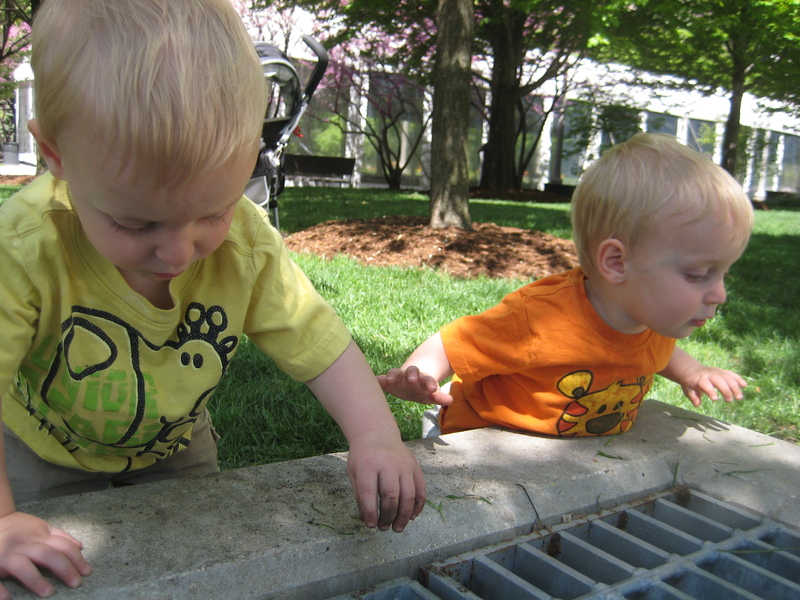 After the kids were thoroughly done with the museum, we walked through Grant Park and found an area mostly enclosed with shrubs and let the boys loose. They chased a rabbit, watched squirrels and found the only patch of dirt in the whole park to dig in. So great. After about an hour we walked up to Millennium Park to take a picture by the huge bean. Since the sun finally decided to come out, it was the perfect day to be outside. We shopped for souvenirs (and breakfast food….) on our way back to the hotel. We got back just in time to go to dinner with Daddy. We drove (because our feet had enough walking for the day) to Pizzeria Due for Chicago deep dish pizza. It was so, so good. We should have ordered ahead. Each pizza takes like 40 minutes to bake. So the kids were starving again and super tired. They didn’t hold together as well as last night. I finally took the twins outside to walk while everyone else finished eating. What a super long and fun day! We checked out of our first hotel early in the morning and took Derek to “work” (business meeting with Bridgestone Firestone). 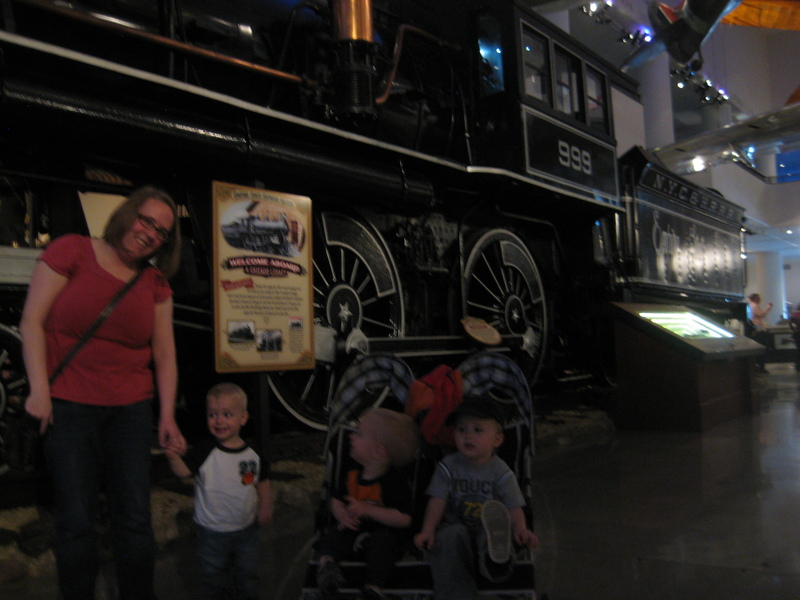 Janel and I drove to The Museum of Science and Industry with the boys. We got there just in time for all of the school field trips to show up. It was really crowded and our kids were a little young for everything. It is a really cool museum though. 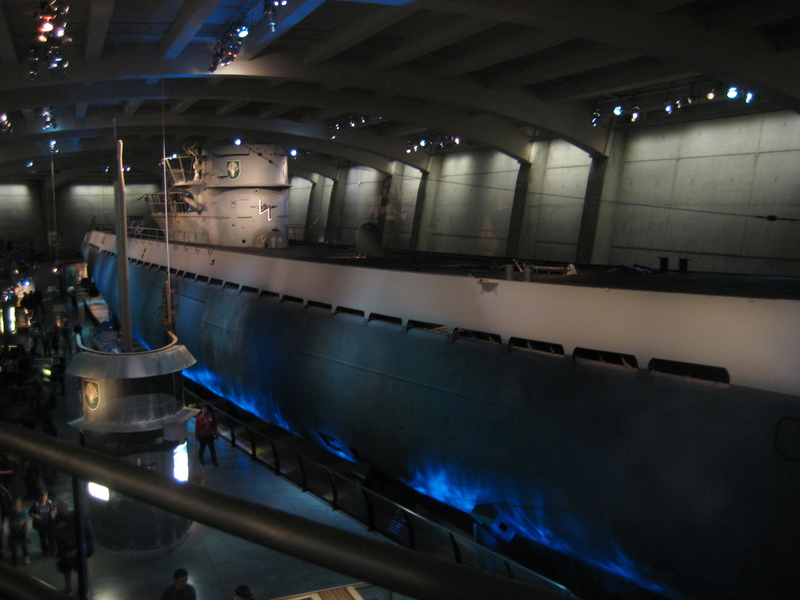 There is a full size submarine, train engine, airplane and subway train to tour. Older kids can dissect an eyeball or owl pellet and do other hands on science activities. 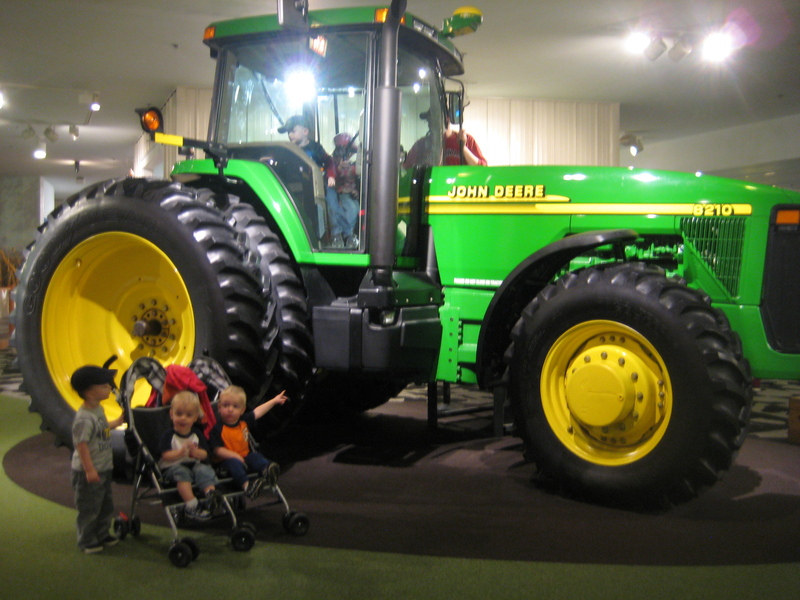 Isaac “drove” a tractor and a combine and watched the big model trains. 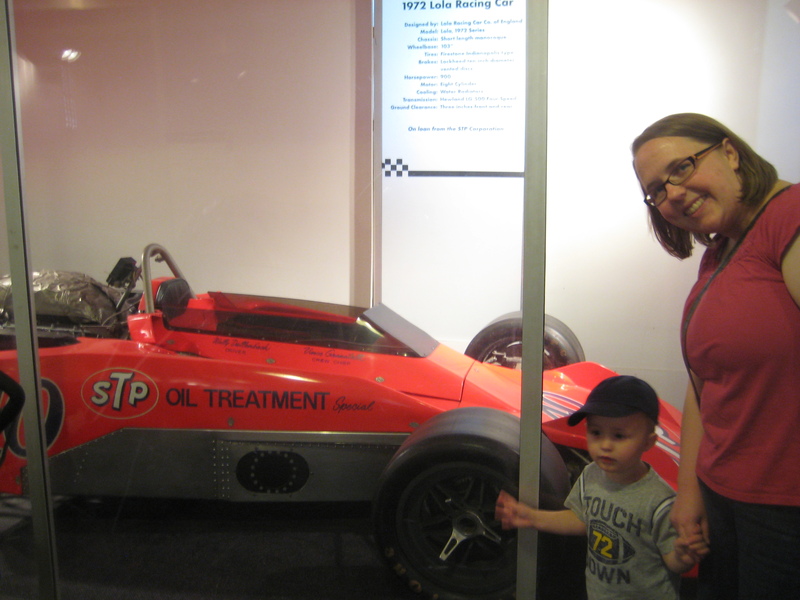 His very favorite thing was seeing the race cars. We stayed until lunchtime and then had PB&J in the car before heading to the Art Institute. The art museum was even worse on the boys than the science museum. I hoped they would sleep in the stroller but no luck. They were super cranky and we didn’t last long. We did see American Gothic, A Sunday Afternoon on the Island of La Grande Jatte, some Van Gogh and Georgia O’Keefe stuff and a few Monets before we left. 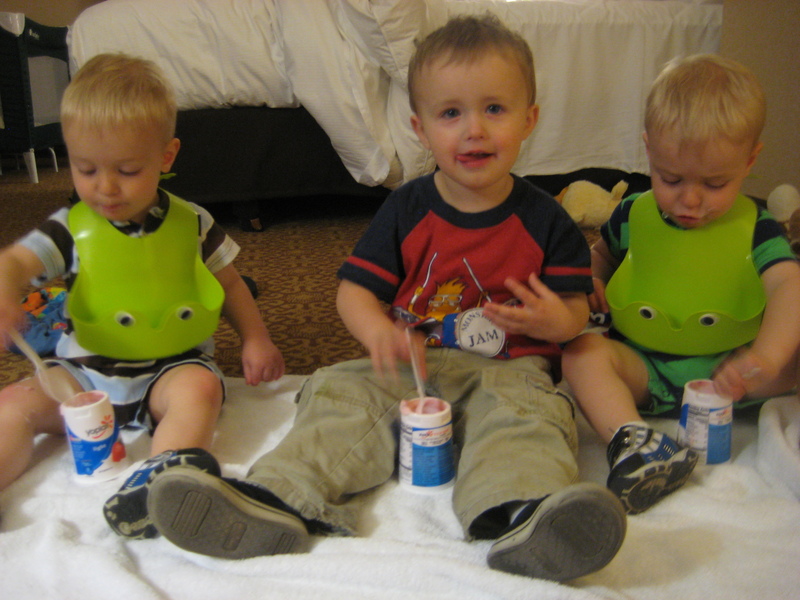 We checked in to the Hilton (which is where Derek’s conference is going on all week) and spent the afternoon entertaining the kids in the hotel room. Dinner was on Derek’s boss at the Grand Lux Cafe. We walked a little over a mile both ways so the kids were pretty worn out and hungry by the time we got there. Luckily they didn’t melt down too bad and the food was delicious so it was successful. 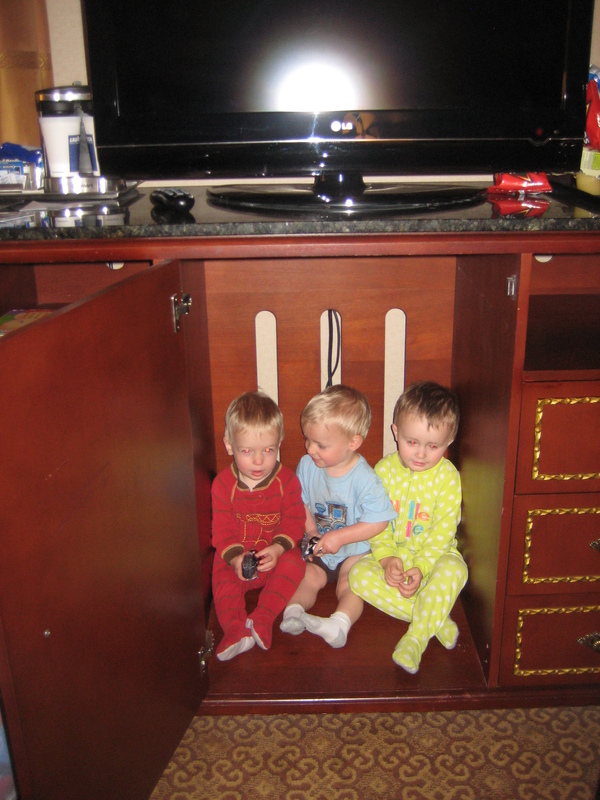 Also a bonus: two kids were asleep by the time we got back to the hotel. Easy bedtime! Poor Auntie Janel woke up sick this morning so we let her rest at the hotel for most of the day. We rented a car this morning (super ridiculously posh Town and Country minivan) and went to Walmart to stock up on diapers (which I couldn’t bring myself to haul here in a suitcase) and PB&J sandwich stuff. After lunch Derek and I took the boys out to Glenview. We drove by the temple and snapped a couple of photos before going to the Kohl Children’s Museum for the rest of the afternoon. 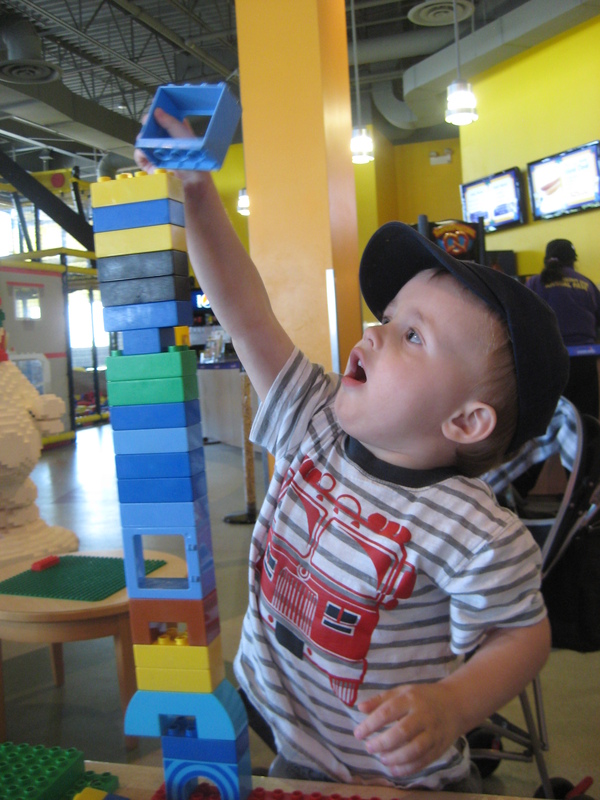 When I was planning the trip I had wanted to take the boys to the children’s museum down at the pier in town but decided it was too expensive for something we could do at home. Then Derek heard about the Kohl Museum and we decided to go for it since it was much better priced and in a more convenient location. The boys had a lot of fun and we wore them completely out. Luckily Janel was feeling a little better by dinner so she joined us at Boston Market. They sent Janel and me home with flowers and chocolate and the boys got balloons. What more could we ask for? We entertained the boys with the balloons and some more swimming before bed. They are all getting more comfortable in the water. Even Cooper was splashing around at the end a little bit. Isaac enjoyed being a “whale” and a “boat” with super swim teacher Daddy.